‘We cling on to the idea that the UK is so different from all the other countries.’ And change, says Bloomsbury’s Richard Charkin, is a new constant. 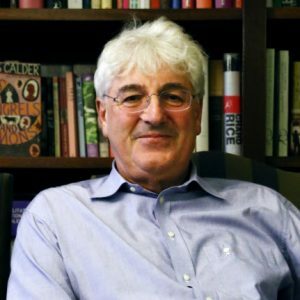 Check out my interview with Richard Charkin, Executive Director of Bloomsbury Publishing, publisher of Harry Potter, for the New York based Publishing Perspectives in full below or the original here. British publishers “still seem to focus too much on the UK market,” says Richard Charkin, executive director of Bloomsbury Publishing, past president of the International Publishers Association and well-known champion of the United Kingdom’s publishing industry. The book industry has been in a state of flux for years, from the advent of the digital dynamic to the rise of Amazon and self-publishing. Earlier this summer, Charkin gave the keynote address at an event run by UK-based book-publishing community BookMachine and the trade union Unite. The event’s long title was United We Publish III: Consent or Coercion—Shape Your Fate in an Age of Change. With that “age of change” factor in mind, Publishing Perspectives has spoken with Charkin on the change he has experienced, and on where he thinks change will have its most impact going forward. Full Circle: An End to Specialization? “One of the biggest changes since I started in the industry back in 1972,” Charkin says, “was specialization. “Back then, most publishers did a bit of this and a bit of that—academic, educational, fiction, and even children’s publishing—and they were typically family-owned. It worked because there was one dominant channel to market and it was called the bookshop. They supplied nearly all your customers. “Over time bookshops lost the contracts for libraries, schools, and universities to other organizations, and other arguably more efficient routes to market emerged. Being an all-around publisher became less sustainable. Maybe ironically, Charkin says he feels that things may be changing back somewhat. “We now have the Kindle, which can carry all the different routes to market for an academic, fiction, or kids’ book in one device. Amazon is itself rather like the old-fashioned small bookshop in that it sells everything, to everyone. The next significant change that Charkin experienced was globalization—and he thinks some of the British trade publishers have yet to fully come to terms with it. “Back then, we were concerned about Britain and the Commonwealth,” he said. “And that now has changed. We’re blessed with English and the development of English Language Teaching (ELT) publishing. “If you study OUP (Oxford University Press), in the pre-war period they set up their branches on the back of the Bible. In my time, new branches in Japan, Continental Europe, and South America have grown on the back of ELT. “There’s still a way to go as we don’t quite think globally enough. Academic publishing has been global for decades, and trade publishing just hasn’t been. “Books sold in Australia will have a book jacket that reflects British tastes. It’s great to get your book mentioned in the Evening Standard, but I would prefer to be in The New York Times or on CNN. Another of Charkin’s observations is that most of the time change happens less quickly than people think it will, but when the tipping point happens, it happens fast. In 1981, he did the first digital licensing deal on dictionaries to create the first spell-checker out of the Pocket Oxford Dictionary. In 1995 he worked on Biomednet, an early social network for scientists. “It took forever for the ebook to emerge in 2007,” Charkin says, as Amazon rolled out the original Kindle ecosystem. “And by God, when it did, it was quick. And yet, Charkin says, people working in the industry haven’t changed much. When Charkin looks ahead, incoming changes appear to be arriving with a lot of complexity. “Copyright is constantly under challenge both from governments and from tech companies,” he says. “Provided we can retain its fundamentals, the industry will be healthy. “But we have to face up to the fact that we’ve allowed our industry to become over-complicated. “For instance, the development of a new royalty system is in my view almost harder than landing a man on the moon in terms of the complexity of the algorithms that we’d have to build. And finally, Richard Charkin joins many colleagues in voicing one of the most stubbornly vexing challenges for this industry-in-transition. “In order to get a book into Barnes and Noble, you have to tell them a year in advance in order to get into their catalog. Next Destiny of the Species: Are animals adapting better to climate change than we think?